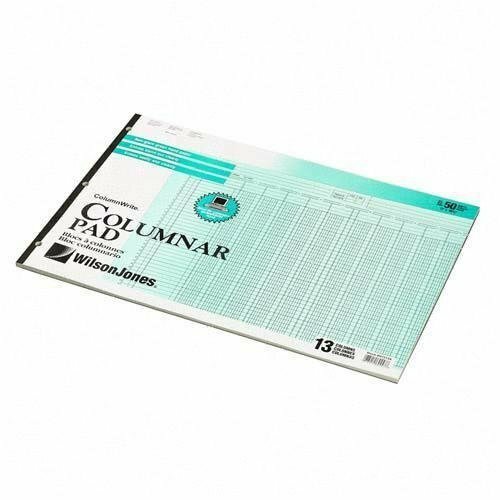 Get your numbers right with Wilson Jones ColumnWrite Columnar Pads. Convenient pads provide plenty of space for your facts and figures, with 41 numbered lines and 4 columns per sheet. Each column measures 2 3/8 wide and includes 10,000,000 units. The letter-sized sheets are a standard 8-1/2 x 11 size and each pad contains 50 sheets. The sheets are tinted pale green, and are designed with alternating shaded columns to ensure legibility. Pages are double-sided and ruled on both sides with green and brown ink. This handy pad fits neatly into most folders, briefcases and backpacks for easy transport, and it s pre-punched with three holes, so it fits into three-ring binders as well. 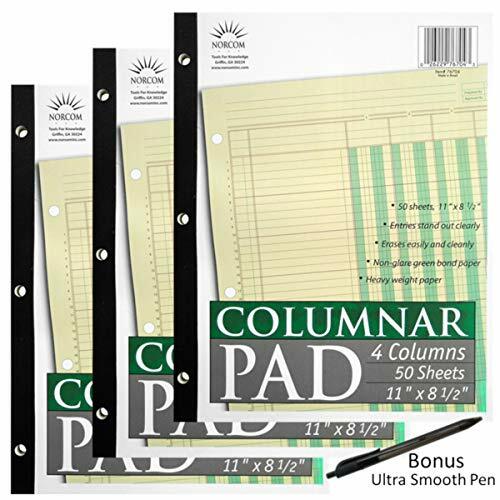 41 LINES WITH 4 COLUMNS PER SHEET - Convenient Column Write pads provide plenty of space for facts and figures, with 41 numbered lines and 4 columns per sheet. Includes 10,000,000 units per column. LETTER-SIZED SHEETS - Sheets are a standard letter-size, 8-1/2 x 11, with 50 sheets per pad. Each column measures 2-3/8 wide. GREEN-TINTED AND DOUBLE-SIDED - Sheets are tinted pale green, with alternating shaded columns to ensure easy visibility. Pages are double-sided and ruled on both sides, with green and brown ink. CONVENIENT PAD - Handy pad allows you to take your numbers on the go. It fits neatly into almost any folder, briefcase or backpack. PRE-PUNCHED - Pad is pre-punched, with three holes that allow it to fit neatly into three-ring binders. Wilson Jones is a leading source of reliable, quality products that help consumers work faster, smarter and better at the office, home, or at school. Whether you are a corporate professional, a home-based entrepreneur, a business traveler, a student, or a head of a busy household, there are Wilson Jones products to fit your every specific need. 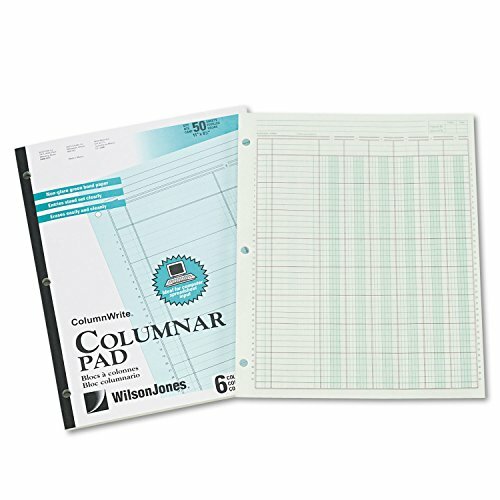 Wilson Jones Column Write Pads are perfect for accounting, record keeping, and setting up computer spreadsheets. They feature alternative thousands columns which are shaded to prevent decimal slip and ensure accuracy. All rows are numbered and sheets are printed in green and brown inks to reduce page glare. Every fifth line is ruled in brown for better focusing. The sheets feature a perforated heading which tears off when folding to fit 11 x 8.5 Inch binder. There are 50 3-hole punched sheets per pad and each sheet is printed both sides for convenience. Wilson Jones accounting supplies add up to exceptional value! With an extensive and innovative selection and quality materials, Wilson Jones provides everything you need to become virtually unstoppable in today's fast-paced work and school environments. Sheets are made of heavyweight, buff or green-tinted bond for pen and pencil writing. Each sheet is three-hole punched with 1/4" round holes. Each pad is bound 50 sheets per pad with a chipboard back and flexible pressboard cover. Brown and green ink. Sheets are made of heavyweight, buff or green-tinted bond for pen and pencil writing. Each sheet is three-hole punched with 1/4 round holes. Each pad is bound 50 sheets per pad with a chipboard back and flexible pressboard cover. 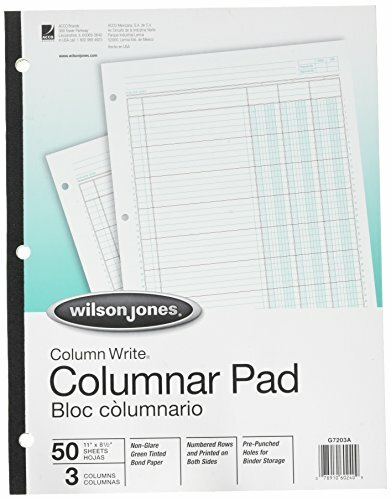 Get your numbers right with Wilson Jones ColumnWrite Columnar Pads. Convenient pads provide plenty of space for your facts and figures, with 41 numbered lines and 8 columns per sheet. Each column includes 10,000,000 units. The letter-sized sheets are a standard 8-1/2 x 11 size and each pad contains 50 sheets. The sheets are tinted pale green, and are designed with alternating shaded columns to ensure legibility. Pages are double-sided and ruled on both sides with green and brown ink. This handy pad fits neatly into most folders, briefcases and backpacks for easy transport, and it s pre-punched with three holes, so it fits into three-ring binders as well. 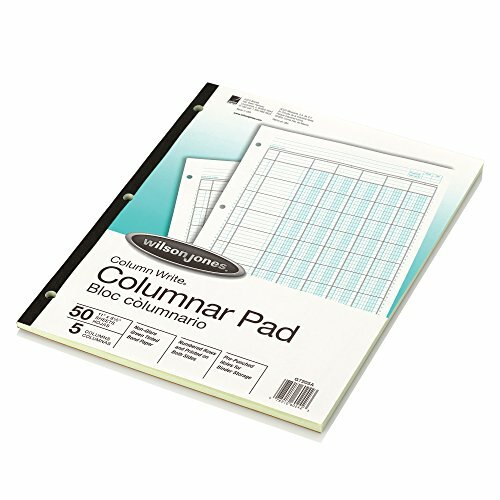 41 LINES WITH 8 COLUMNS PER SHEET - Convenient Column Write pads provide plenty of space for facts and figures, with 41 numbered lines and 8 columns per sheet. Includes 10,000,000 units per column. LETTER-SIZED SHEETS - Sheets are a standard letter-size, 8-1/2 x 11, with 50 sheets per pad. PRE-PUNCHED - Pad is pre-punched, with three neat holes that allow it to fit neatly into three-ring binders. Wilson Jones is a leading source of reliable, quality products that help consumers work faster, smarter and better at the office, home, or at school. Whether you are a corporate professional, a home-based entrepreneur, a business traveler, a student, or a head of a busy household, there are Wilson Jones products to fit your every specific need. 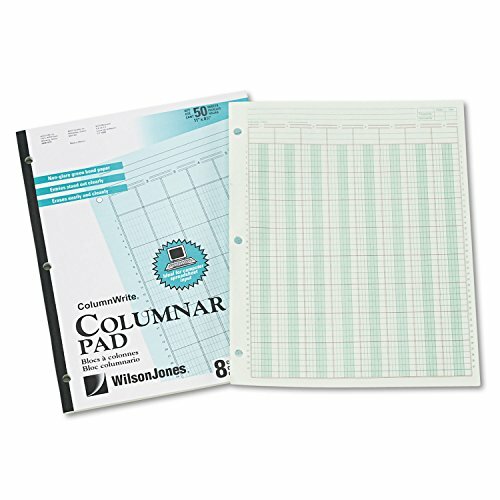 Wilson Jones ColumnWrite Pads are perfect for accounting, record keeping, and setting up computer spreadsheets. They feature alternative thousands columns which are shaded to prevent decimal slip and ensure accuracy. 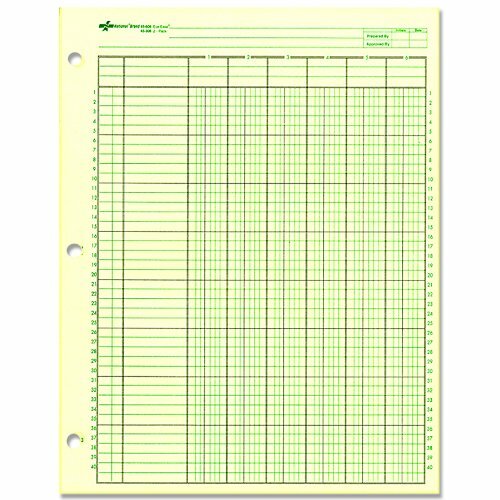 All rows are numbered and sheets are printed in green and brown inks to reduce page glare. Every fifth line is ruled in brown for better focusing. The sheets feature a perforated heading which tears off when folding to fit 11 x 8.5 Inch binder. The 50 sheets in each pad are 3-hole punched and printed on both sides for convenience. Wilson Jones accounting supplies add up to exceptional value! With an extensive and innovative selection and quality materials, Wilson Jones provides everything you need to become virtually unstoppable in today's fast-paced work and school environments. Includes SolidJoy Letter Opener. SolidJoy is a registered trademark with the U.S. Patent and Trademark Office, and SolidJoy is registered by Amazon in the Amazon Brand Registry. 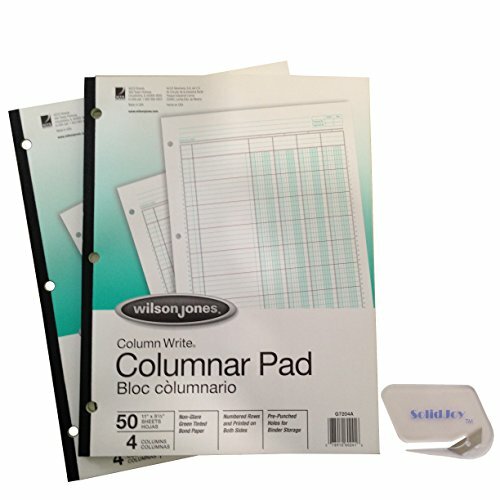 Brand: Norcom | Manufacturer: Norcom Inc.
Get your numbers right with Wilson Jones ColumnWrite Columnar Pads. Convenient pads provide plenty of space for your facts and figures, with 41 numbered lines and 3 columns per sheet. Each column measures 3 7/16 wide and includes 10,000,000 units. The letter-sized sheets are a standard 8-1/2 x 11 size and each pad contains 50 sheets. The sheets are tinted pale green, and are designed with alternating shaded columns to ensure legibility. Pages are double-sided and ruled on both sides with green and brown ink. This handy pad fits neatly into most folders, briefcases and backpacks for easy transport, and it s pre-punched with three holes, so it fits into three-ring binders as well. 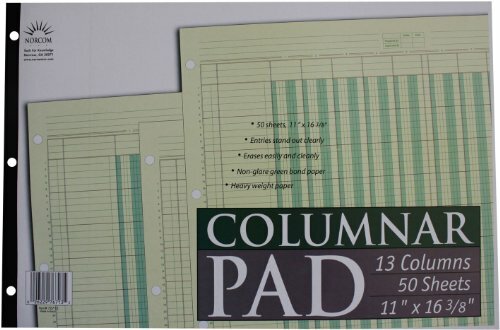 41 LINES WITH 3 COLUMNS PER SHEET - Convenient Column Write pads provide plenty of space for facts and figures, with 41 numbered lines and 3 columns per sheet. Includes 10,000,000 units per column. 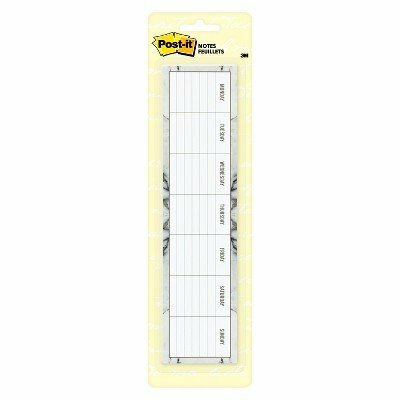 LETTER-SIZED SHEETS - Sheets are a standard letter-size, 8-1/2 x 11, with 50 sheets per pad. Each column measures 3-7/16 wide. Norcom columnar pads are perfect for accounting, record keeping, and setting up computer spreadsheets. These columnar pads each have 50 sheets with 4 columns on each sheet. 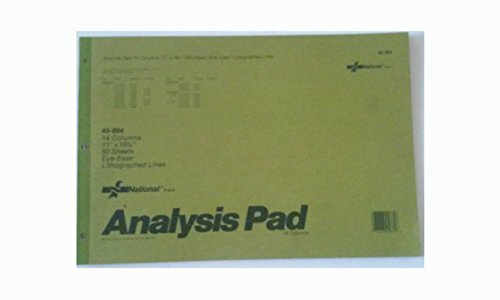 You get 150 total 2-sided sheets with these 3 pads. Norcom is one of the nation's most innovative manufacturers of school, office and home office products. 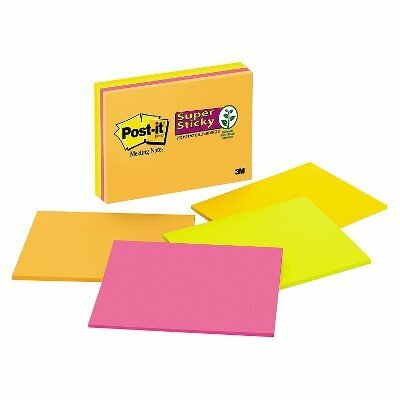 Post-it Notes Super Sticky Meeting Notes stick to almost any surface and won't fall off. They're great for planning, brainstorming and note-taking. A World of Color Rio de Janeiro Collection celebrates its namesake's Brazilian metropolis with expressive, dramatic colors. Pad Type: Super-Sticky; Sheet Size (W x H): 8" x 6"; Number of Sheets per Pad: 45; Shape: Rectangle. 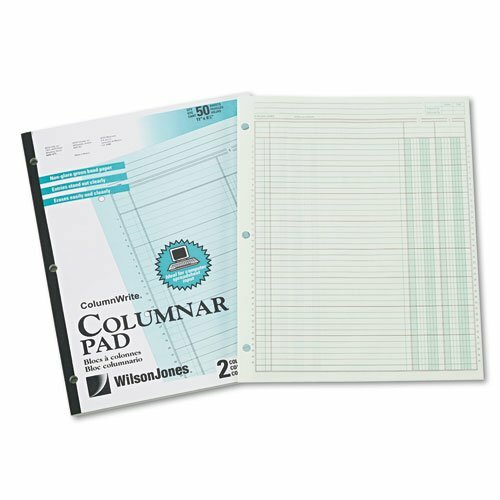 Get your numbers right with Wilson Jones ColumnWrite Columnar Pads. Convenient pads provide plenty of space for your facts and figures, with 41 numbered lines and 4 columns per sheet. Each column measures 2 3/8 wide and includes 10,000,000 units. The letter-sized sheets are a standard 8-1/2 x 11 size and each pad contains 50 sheets. The sheets are tinted pale green, and are designed with alternating shaded columns to ensure legibility. Pages are double-sided and ruled on both sides with green and brown ink. This handy pad fits neatly into most folders, briefcases and backpacks for easy transport, and it s pre-punched with three holes, so it fits into three-ring binders as well. Includes five pads of 50 sheets each. 41 LINES WITH 5 COLUMNS PER SHEET - Convenient Column Write pads provide plenty of space for facts and figures, with 41 numbered lines and 5 columns per sheet. Includes 10,000,000 units per column. LETTER-SIZED SHEETS - Sheets are a standard letter-size, 8-1/2 x 11, with 50 sheets per pad. Each column measures 1-22/32 wide. 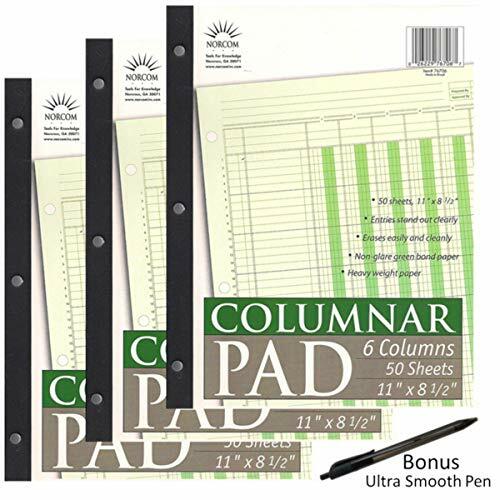 Norcom Columnar Pad, 6 Columns, Made in The USA, 11 x 8.5 Inches, 50 Sheets Per Pad (76706-10) Pack of 3 Plus 1 Ultra Smooth Pen by JustWritin"
Norcom columnar pads are perfect for accounting, record keeping, and setting up computer spreadsheets. These columnar pads each have 50 sheets with 6 columns on each sheet. You get 150 total sheets with these 3 pads. 1 Ultra Smooth Pen by JustWritin' included as a bonus. Norcom is one of the nation's most innovative manufacturers of school, office and home office products. 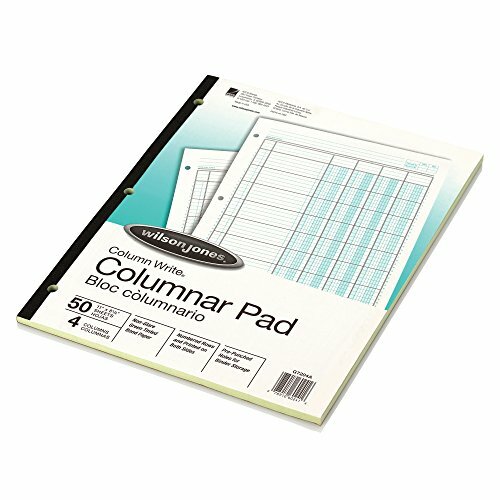 Column Write Pads are ideal for accounting. Alternating shaded columns help you keep decimals aligned. Each sheet is prepunched for easy three-ring binder insertion. Various column counts available. Shaded alternate thousands columns prevent decimal slip. Virgin Vintage Product. New and unused. Perfect for setting up computer spreadsheets. All rows and columns numbered for accuracy and fast referencing. Shaded alternate thousands columns prevent decimal slip. Every fifth line ruled in brown for better focusing. Punched for storage in ring binder. Perforated heading tears off when folding to fit 11 x 8 1/2 binder. 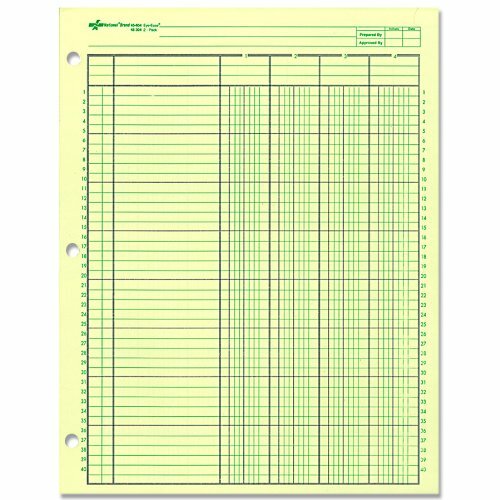 Sheet Size: 11amp;quot; x 8 1/2amp;quot; Form Type: Accounting Format: 50-Sheet Pad Layout: Sheet Ruled Both Sides Alike Single-Page Form. 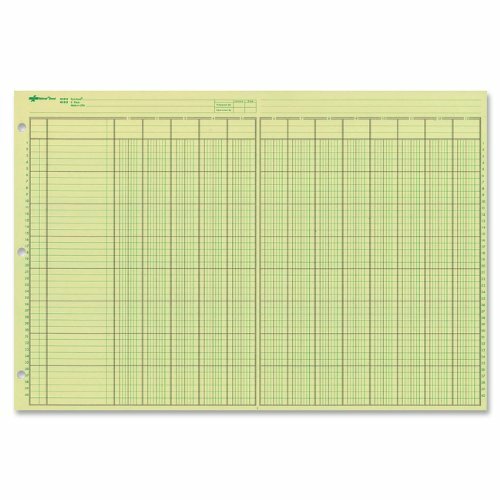 Sheet_Size - 11" x 8 1/2"
Perfect for setting up computer spreadsheets. All rows and columns numbered for accuracy and fast referencing. Shaded alternate thousands columns prevent decimal slip. Every fifth line ruled in brown for better focusing. Punched for storage in ring binder. Perforated heading tears off when folding to fit 11 x 8 1/2 binder. Ruled Both Sides. Sheet Size: 11 x 8 1/2; Form Type: Accounting; Column Headers: N/A; Format: 50-Sheet Pad.